Beatnik fashion is the 1950s version of bohemian chic. Before hippies, after flappers, between 1930s and 1990s hipsters, beatniks were a safer, more suburban version of the beat generation. It's easy to get the beatnik look, with a little practice and the right attitude. Read on to find out how. Photo by Ann Larie Valentine. There are two different kinds of beatnik fashion: real fashion (what 1950s beatniks actually wore) and a beatnik costume (as worn by the woman in the photo above). Both looks are easy to replicate; why not learn both? The word "beatnik" was coined by San Francisco columnist Herb Caen in 1958, to describe the young beat generation. These "bearded cats and kits," much like today's hipsters, didn't work, hung out in coffee shops and aspired to artistic grandeur. There aren't too many photos of beatniks, so one has to go by the photos we have and the descriptions of former scenesters. Adam Faith described beatnik cafes as "all black polo necks and existentialism." 1950s fashion was more conservative than today's fashion; beatniks therefore did not have to go far to arouse society's ire. Striped shirts, oversized sweaters and cowl collared tops were favored for both sexes. Young women often wore collared jerseys, or short-sleeved sweaters, with slim-fit pants or pencil skirts, a fetching and feminine look that was still sufficiently bohemian. In rebellion to the frilly aesthetic of the time, many women favored capri pants, black jeans and stirrup slacks. Jewelry, if worn, often featured eastern religious symbols, reflecting the beats' inchoate, eastern-inspired philosophy. Some daring young men favored skinny black jeans, though this was more a rocker look. Many dressed almost as conservatively as their parents, in slacks with a belt and short-sleeved white shirts. 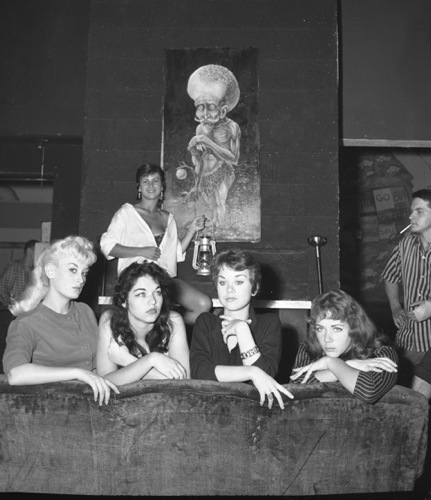 Beatnik was the first youth subculture to favor wearing all black. Like goths, beatniks were also given over to philosophical maundering––although beatniks were more existential and less maudlin. Young men let their hair grow, though not too much; many favored a pompadour or an outgrown crew cut. 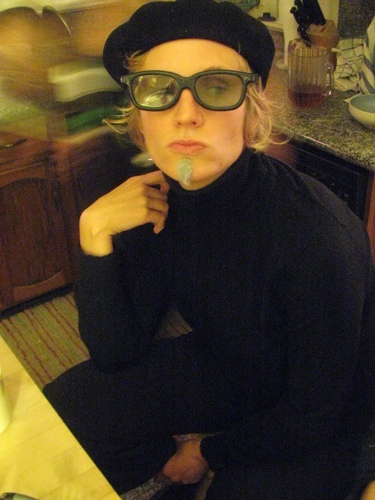 Some beatnik men wore a goatee, a "soul patch" or sideburns. Others just let their facial hair grow, a real act of rebellion in the 1950s and early 1960s. Young women generally left their hair long, or cut it short in a bob. It would not surprise me, though, if some had short androgynous haircuts, a la Teddy Girls. ...[W]hen dollars were plentiful and the exchange value of the franc was low, Paris was invaded by such a swarm of artists, writers, students, dilettanti, sight-seers, debauchees, and plain idlers as the world has probably never seen...The populace had grown so hardened to artists that gruff-voiced lesbians in corduroy breeches and young men in Grecian or medieval costume could walk the streets without attracting a glance, and along the Seine banks Notre Dame it was almost impossible to pick one's way between the sketching-stools. It was the age of dark horses and neglected genii; the phrase on everybody's lips was 'Quand je serai lancé.' [Once I'm launched] As it turned out, nobody was 'lancé,' the slump descended like another Ice Age, the cosmopolitan mob of artists vanished, and the huge Montparnasse cafés which only ten years ago were filled till the small hours by hordes of shrieking poseurs have turned into darkened tombs in which there are not even any ghosts. The beat generation owes much to this swarm of Parisian artists and "plain idlers" in the 1920s; their aesthetic is copied from them and adapted to 1950s America. Beatnik fashion, however, has little to to do with beat poets like Allen Ginsberg and Diane di Prima. Wearing the uniform of a poet doesn't make you one.